Submitted by kathyf on June 23, 2015 – 12:41pm. Still using the SFSD recipe from Crust and Crumb. Last week we went to the farmer’s market and as we were passing by a bakery stall my daughter and her husband spied the olive bread. “We want olive bread!”Not being a real fan of olives unless it’s in pizza or lasagna, I hadn’t really considered making it. Anyways, a few days ago I tried my hand at olive bread using a can of sliced black olives. They complained that they couldn’t really taste the olives in it. So this time I used lots of Kalamata olives. It turned the bread purple and really tastes like olives. We will see if they like it now. 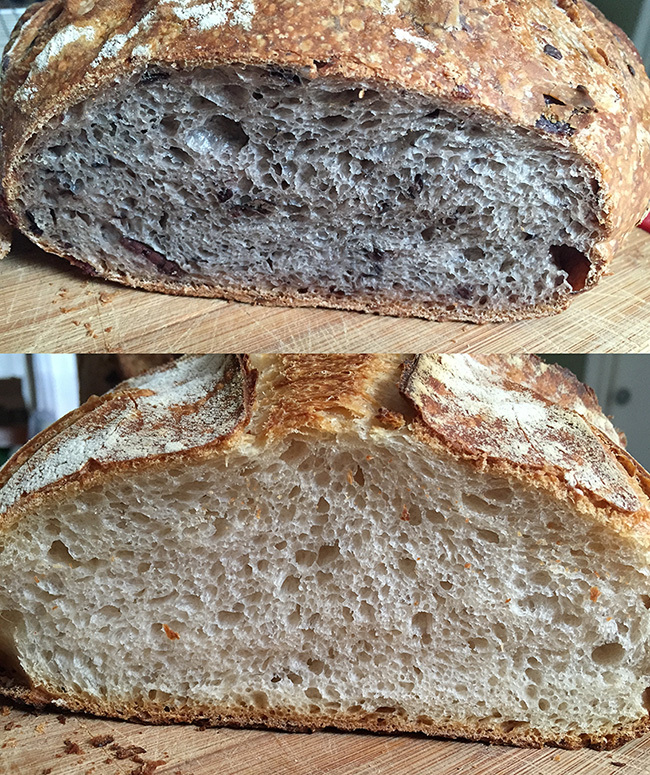 I used one of my loaves of SFSD for the olive bread and the other is plain. I put the olives, a tablespoon of the brine and a tablespoon of roasted garlic olive oil in the dough. The olives really increased the hydration. I should of held back more of the water. I ended up working in a bit more flour to get it how I wanted it. It still turned out a bit wetter than the other dough. When I added the olive oil last time I made olive bread, I liked what it did to the texture of the crust. It seemed to come out a bit thinner, a little more tender, but still crispy. So this time I added a tablespoon of butter to the second loaf and I do like how crust turned out. And they did sing to me nicely afterward. Another difference this time is that I didn’t get to use my dutch oven. My daughter decided to make chili this morning and didn’t realize I needed the pot for the bread. So I improvised. I used my pizza stone and an old stainless steel dutch oven over it. I used it as a lid because I don’t have the lid for the pot anymore. Looks like it worked out well this way too. Except I burned my knuckle trying to maneuver that pot over the bread!